To the shouts of "Gimmel! 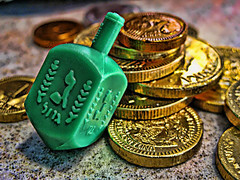 ", we fried potato pancakes (latkes) all night and gave away driedels and gelt to the kids. Earlier, Brian and I peeled and fine-grated forty pounds of potatoes and twelve pounds of onions (there was a little bit of crying). Big shouts to Kathy Jo, Esme, and Kevin, Alyssa and Levi, Adam, Lindsey, and Sam, and Nat, Harris, Madeline, and Margot for coming through. Big shouts to Brian for helping so much (including three hours of continuous frying) and Nate for crew-ing the night. Happy to know about this party. I had been to my sister’s dinner party at LA venue. She managed to have delicious food prepared there that was just so mouthwatering. New dishes were arranged. I really liked and enjoyed the day.